Gardening can be simple and fun, but sometimes, certain circumstances can prevent us from tilling the land and planting the back forty – small spaces … land use restrictions … black thumbs. Container gardening can help you cultivate success! The possibilities are limitless. Almost any container can be a garden as long as it has two characteristics. 1. The container can hold soil. 2. Water can drain from the container. Adequate drains are vital. Excess water should flow from the bottom of the container, so several drain holes are ideal. If you want to use a container with no holes (a wooden box, a tin can, a glass jar) then you can simply drill holes. Or, if you cannot drill holes, line the bottom of the container with small stones to encourage draining but prevent flooding of the plant’s roots. If you want to use a porous container such as a basket as a container garden, line the container with nursery cloth or loosely woven burlap to trap soil but maintain drain capability. Avoid containers with attached saucers that can trap water and drown roots. Containers should provide adequate space for your plant’s root growth. Generally, vegetables prefer more spacious containers. Avoid dark metal containers, dark plastic containers or dark ceramic containers – especially for plants that require full sun. 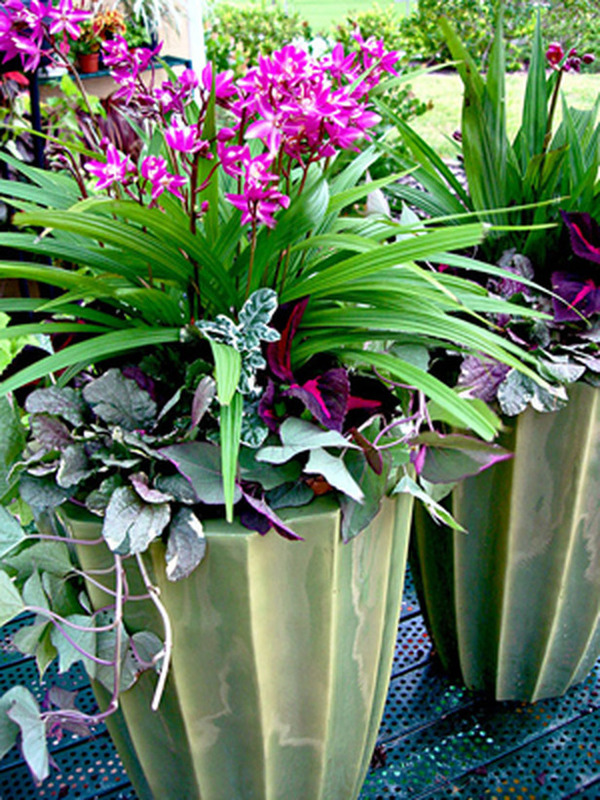 These containers can retain heat and damage plant roots. Always use container soil – not garden soil – in container gardens . Since you will be growing your plants in a confined space, you will need flocculent soil to encourage air circulation, root growth and water flow. Garden soil is often too dense for containers, and garden soil may contain pests, weeds and contaminants. You can create your own container soil by combining 1) one part of rich compost, 2) one part of either vermiculite, Perlite or builder’s sand and 3) one part of container soil. You can also customize this soil to meet the specific needs of your environment or plants. To stabilize containers in windy environments, you can use sand instead of Perlite for added weight. To increase the moisture retention of water intensive crops such as tomatoes, you can use vermiculite instead of sand. Almost any plant can be cultivated in a container. Purchase healthy plants to ensure success. When selecting plants, examine their leaves and their root structures. Leaves should be green and moist – not yellow, wilted or dry. Roots should be white and translucent. Be wary of any indications of diseases or pests. 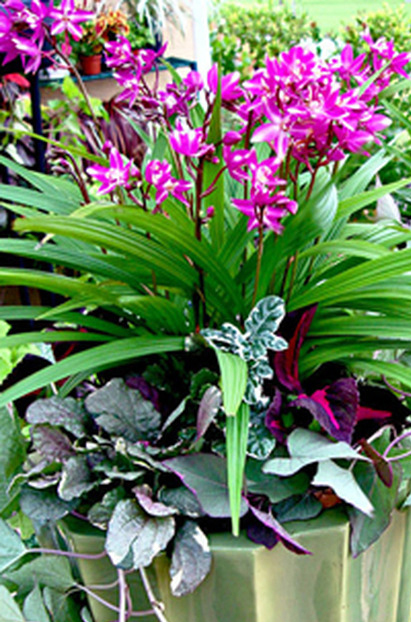 Consider the placement of your containers and your environment when selecting plants. If you plan to place your containers in full sun, choose plants that prefer full sun (6 to 8 hours of direct sun each day). If you plan to place your containers in shade, choose plants that prefer shade. Plants that are placed in the same container should have similar requirements for sun exposure, irrigation and fertilization. For example, do not plant impatiens with petunias. Impatiens prefer shade while petunias prefer heat. Plant a variety of plants with similar care requirements in the same container garden for visual interest. Choose a thriller, a filler and a spiller – one spire plant that will be the focal point of the arrangement, one mounding plant that will fill the container and one vining plant that will fall over the edges of the container. You can also group plants according to color or texture. Or, create a themed garden such as a Spaghetti Sauce Garden with tomatoes, onions, peppers and herbs. When transferring a plant from its original container to its permanent container, remove the plant from its original container carefully to prevent root shock. Massage the soil ball to loosen the roots so they can expand into their new environment. In the height of summer, you may have to water your container garden at least once each day. Generally, if the soil is dry within one inch of the surface of the container, irrigate your plants. Wilted or desiccated leaves indicate a need for water as well. Irrigate thoroughly. Plants retain a soaking more efficiently than a misting. Apply water directly to the soil, not to the leaves of the plants. Irrigate your plants according to their water requirements, but do not overwater. If a plant’s roots are flooded, they can rot. Rotted roots can eventually lead to plant death. Plants thrive with six key nutrients: oxygen, hydrogen, carbon, nitrogen, phosphorus and potassium. Perform a soil test to determine if your soil is deficient in certain nutrients. If so, add those nutrients by applying a fertilizer. Fertilize according to your plant’s individual needs. Fertilize plants that require minimal nutrients (potato, radish, spinach) once, early in the growing season. Fertilize plants that require normal fertilization (green bean, lettuce, pepper, apple, strawberry, tomato) monthly. Fertilize plants that require intensive fertilization (cucumber, eggplant, squash, blueberry, citrus) semi-monthly. Use stakes, cages or trellises to control vining plants such as sweet pea, clematis, honeysuckle or tomato. Prune your plants when they appear ragged, when blossoms fade and when areas indicate the presence of diseases or pests. Pruning prevents disease and encourages regeneration. A tidy container is a healthy container. At the end of the growing season, compost your container soil and clean the containers thoroughly. Always store containers when they are dry. I think what you posted was actually very logical. However, think on this, suppose you wrote a catchier post title? Gardening 101 | Sustainable Fort Bragg is kinda vanilla. You ought to peek at Yahoo’s home page and note how they create post titles to grab viewers to click. Thank you for letting us know what you think! Your feedback is important to us! I agree that perhaps a more catchy title would grab viewers. Since we have viewers of all ages we try to stick to titles that are easy to search. I will certainly keep your suggestion in mind when working on upcoming blog posts! If you have any ideas or other feedback, please let me know! That is wonderful news! We love to get feedback from our readers! However, due to pubishing guidelines, we do not allow for guest writers at this time. If you have any ideas of what you would like to see, please let me know! Thank you again for the feedback!